Spirituality / Why I will never trust Satan, what Satan did to me, and why I hate Satan. I used to worship Satan because a demon came to me and demanded it. I recognized it was trying to become symbiotic with my mind and shut off my ability to construct my mind(My whole life I've tried to advance my mind to Super Genius). As I rebelled against Satan and Satan's demons and became more powerful in magick I figured out what Satan was trying to do to me. Satan was trying to turn me into a tormented monster/demon to feel pain rather than pleasure. Satan tried to have me deny my own good. He behaved like a crackhead and tried to curse me. Later I realized Satan actually has limitations to his power, that's why everything was so minor against me. However he did take control of all my friends and turned them into cultists. Religion is dangerous. False Gods like Satan are dangerous. The True Gods are us, not the monsters that would try to assimilate us. Metaphysics you may have never considered yet. 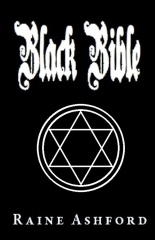 I present the Black Bible series for metaphysical philosophy. A spellbook written by me because the best way to learn magick is to write about magick!